In 1803 President Jackson signed the Indian Removal Act. This legislation authorized the removal of all tribes east of the Mississippi River to Indian Territory in the West. The Native Americans were moved for several reasons. The settlers moving west wanted their land to build farms on due to overcrowding in the east, gold was found on Native American land, settlers wanted to end the violence that they felt the Native Americans were responsible for but still take their land, and whites felt that they had a right to expand west. Between 1830 and 1850, about 100,000 Native Americans moved west. Those who resisted found themselves facing forcible removal by the U.S. Army. In 1838, President Martin van Buren forcibly expelled 16,000 Cherokee Indians from their homelands in Tennessee, Alabama, NC, and Georgia. This march became known as the Trail of Tears. The Cherokee’s treatment by the government represents an extreme example of how Native Americans in general were treated through much of the 1800’s. Whites tended to see Native Americans in very prejudiced ways. They were considered savages who could be rounded up and made to behave. They were considered barriers to progress for settlers who wanted to expand west, and Native Americans were also not considered citizens of the United States, therefore the Constitution did not apply to them. The United States Senate ordered the Cherokee Indians to be moved in 1838 after gold was found on their land, and forced them to walk 800 miles to new Indian Territory farther west. 16,000 Cherokee made the journey on wagon and by foot through the cold, hunger, and sickness that claimed many lives of children and the elderly. This horrible treatment and journey is why it is called the Trail of Tears. Those who survived the Trail of Tears managed to re-establish their nation in what is now Oklahoma, where their tribal headquarters is presently located. There is actually a term used to describe the belief that white’s had about their right to move west, Manifest Destiny. The term Manifest Destiny is defined as the white settlers belief that they had a god given right to expand America west, no matter what. The belief was that god was on America’s side, and wanted them to move west as far as possible, as if westward expansion was “inevitable” or was going to happen no matter what. 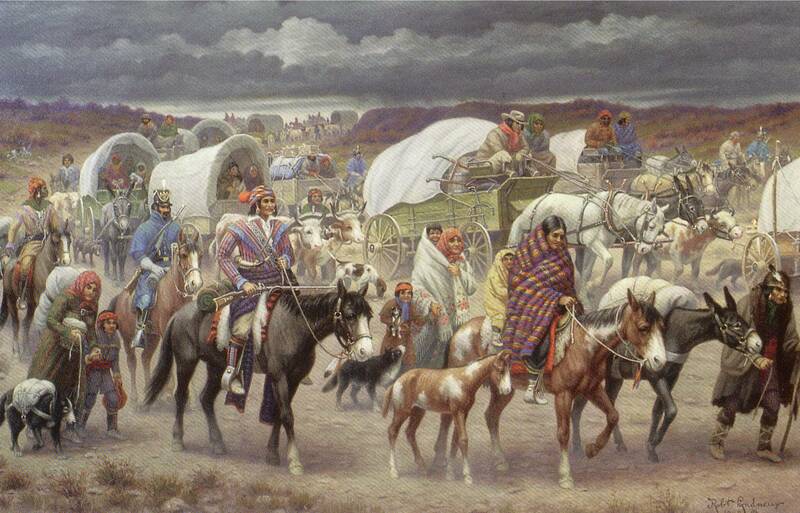 The painting below is of the Trail of Tears. Why were the Cherokee Indians forced off of their land? How did they get to their new land in Oklahoma? What President ordered them off of their land? Why was this called the trail of tears?